Image: A construction worker. Photo by skeeze. This week’s Torah portion is awash in echoes. It begins the priestly story of the building of the Mishkan, the dwelling place for God in the midst of the Israelite camp. The Lord spoke to Moses, saying: 2 Tell the Israelite people to bring Me gifts; you shall accept gifts for Me from every person whose heart so moves him. 3 And these are the gifts that you shall accept from them: gold, silver, and copper; 4 blue, purple, and crimson yarns, fine linen, goats’ hair; 5 tanned ram skins, dolphin skins, and acacia wood; 6 oil for lighting, spices for the anointing oil and for the aromatic incense; 7 lapis lazuli and other stones for setting, for the ephod and for the breastpiece. 8 And let them make Me a sanctuary that I may dwell among them. – Exodus 25:1-8. We can tell, from this list, that the Mishkan was going to be beautiful. And so can we make our homes beautiful: it is fine to have art, to have collections, to do what we can to make our homes lovely. At the same time, we also note that God didn’t extort these materials from the people: they gave according to their means. So if your Mishkan doesn’t have a gold-plated fridge, don’t sweat it. In fact, if your Mishkan has things that are beautiful because of their associations, or because of the people who gave them to us, that’s wonderful! I have a friend who has Shabbat candlesticks her children made in religious school. They are as beautiful as the antique silver sticks in the cabinet. Guess which ones she uses more often? And that is exactly appropriate. I have a little chanukiah I love. It’s made of pot metal. It’s battered and scratched. But I love it, because I had it when I lived in Israel, and its associations are powerful for me. And then there are the other adornments: the adornments of mitzvot performed in your home. Hospitality is a lovely adornment. Shabbat observance is beautiful. Shiva held in the home is sad, but it leaves an aura of sacred beauty afterwards. Tzedakah checks written on the kitchen table, meals cooked for sick friends, words like “I’m sorry” and “I forgive you” are beautiful adornments to a home. My little mishkan has echoes, as well: echoes of Solomon’s Temple, echoes of Creation, echoes of holy moments in my life, echoes of teaching, writing, echoes of the future. What echoes are in your home? What makes it holy? » It defines the boundary of sacred Jewish space. All of those are valid ways to view a mezuzah on the doorpost to the entry to a Jewish house. The last item is the way I see the mezuzah by my front door. When I cross that threshold I move from the ordinary world into sacred space. Out in the ordinary world, Saturday is a day for shopping, errands, and sports. In my home, and in the synagogue, Saturday is Shabbat, a time for love and prayer, study and joy. Out in the ordinary world, December trundles onward towards Christmas and New Year’s Eve: shopping malls are crowded, and the tension is rising. Inside my home, we are recovering from Chanukah, still cleaning bits of wax or oil from unlikely places. I’m thinking about the winter course offerings at Lehrhaus Judaica. My Jewish home is a refuge from the world. It is not entirely separate: I watch TV, listen to the news, read newspapers on the Internet, but all of those things can be turned down or even off. Home is a place of peace for me and for family and guests. It is exclusively Jewish space: whatever goes on outside, inside we’re Jewish. There are books and art, religious objects and food, that make it obvious this is a Jewish home. But what makes it a Jewish home is attitude, and that is the message my mezuzah sends: this is a Jewish space. Posted on December 19, 2015 December 20, 2015 Categories Jewish LivingTags Jewish Home4 Comments on What Makes My Home Jewish? Shabbat on a card table. 1. Make your home as safe as possible. Did you know that this is an actual mitzvah? Deuteronomy 22:8 says that when you build a new house, put a railing around the roof, so no one will fall off. The rabbis extended that mitzvah to include fixing all things that are unsafe around your home. Get rid of frayed electrical cords and things that can trip someone. Change that light bulb: it’s a mitzvah! 2. Display whatever Judaica you own. Use your Chanukah menorah to decorate during the 35 weeks a year it isn’t covered in wax! Let your Shabbat candlesticks decorate your bookshelves during the week, instead of sitting in a cabinet. Whatever you do, don’t worry that the room looks “too Jewish” – it’s a Jewish home, after all! 3. Chores: If you can’t get out of them, get into them. In The Happiness Project, by Gretchen Rubin, she suggests that one way to be happier at home is to attack those chores that you don’t want to do. Feign enthusiasm until you feel it. Crank up the volume on music from your high school days. Focus on the details you do like. These, too, are a way of making home safer. 4. Display photos of the people and places you love. You will feel happier every time you look at them. Pictures are not just for your computer screen and your phone! 5. Establish routines. Since Friday night is Shabbat, have a Thursday night or Friday morning routine to get ready for Shabbat. It might be preparing to make challah – or it might be something as simple as cleaning the kitchen and setting out the Shabbat candles. Use the post-Shabbat “burst of energy” to get chores or work done. Have Shabbat routines! 6. Make your bed every morning. Speaking of routines: making your bed is a three-minute task that gets your day started with a positive accomplishment, and means that when you come to bed at night, your place of rest is restful. What a concept! 7. Observe Jewish time in your home. Keep Shabbat in some form. Observe the holidays, at least in small ways. Get a Jewish calendar and display it – or import one onto your smartphone. 8. Invite guests over. Hospitality is a mitzvah. It’s called hachnasat orchim, welcoming guests. You don’t have to feed them something fancy, just make them welcome. Get takeout and share it on the kitchen table or a card table. Better yet, invite them for Shabbat dinner. 9. Be mindful about consumption of media. Don’t let upsetting news stories run over and over. If you need “background noise” try music. 10. Kindness spoken here. Think twice about the words you use and allow into the house. Treat words that embarrass and words that spread gossip as a kind of filth – don’t let them in! Words are part of the atmosphere of your home, part of the furniture. That goes for “helpful” words that hurt feelings, too. To some of these, you may be thinking, “That’s Jewish?” but seriously, making your home a place of refuge from the world is part of making a Jewish home. May your home, and the homes of all Israel, be places of light and love! 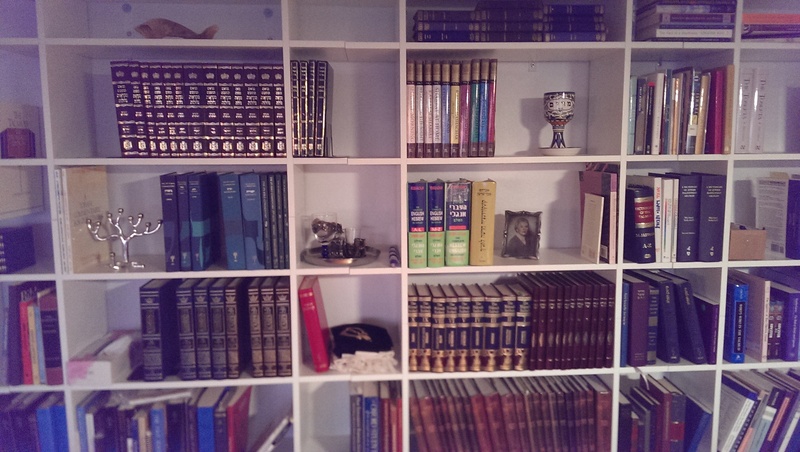 How many Jewish objects can you identify on my shelves? In parashat Shelach-Lecha, we read about Moses sending 12 spies into the Promised Land to see what it was like: what grew there? Who lived there? What would the children of Israel face when they entered the Land? If spies looked in your place, how could they tell that it is a Jewish home? Radio from Israel on the computer? Jewish art made by a child? Can you suggest experiences they’d find in your home that would “give it away” as a Jewish home? Posted on June 13, 2014 June 13, 2014 Categories Jewish LivingTags Jewish Home, mezuzah, Shelach-Lecha10 Comments on What Makes a Home Jewish? I’m feeling tired and happy. A lot of work came to fruition in the past few days. First, I came very close to my goal of posting to this blog every day for the month of November, despite the move, despite everything. I missed one day near the beginning, but otherwise, good. I think the alternative was letting it lie fallow while I went crazy with everything else. 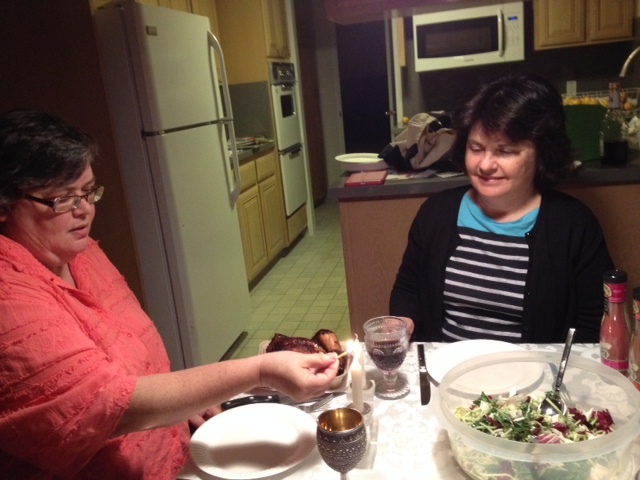 Second, we had the housewarming, the first Shabbat Afternoon Open House. The whole neighborhood was here, and a lot of students, friends, family. Our “Abraham’s tent” with four sides open wide is launched. I’ll continue blogging what I learn about doing Judaism with friends, teaching the process of keeping a hospitable Jewish home. What did I learn yesterday? That not everything has to be perfect. There were a number of things that were not picture perfect, but that was OK. People had a good time. The neighbors had a chance to compare notes on Linda and me, on the house, and to update each other on all the news. My students know how to find me now, and they are looking forward to classes here at the house. My friends were here with love and support. 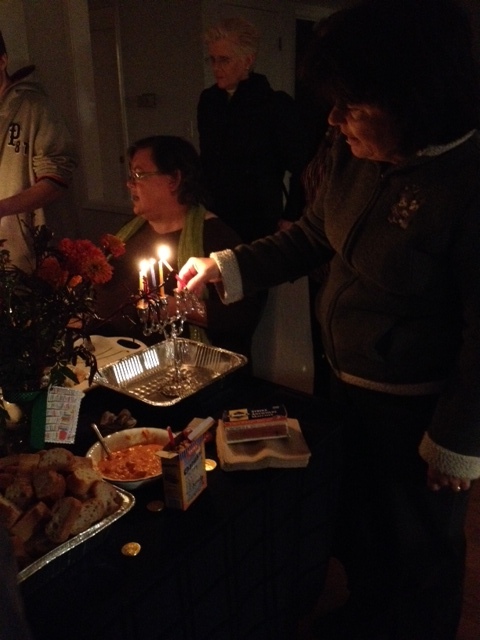 We finished the day with havdalah (hahv-dah-LAH) and menorah lighting, very appropriate. Chanukah means “Dedication” – it’s a memorial of the rededication of the Temple long ago – and yesterday was a celebration and dedication of our new home. I posted last night just before Shabbat that we were going to have our first Shabbat dinner in our new home. It was wonderful! Our friend Dawn came, and we blessed and talked and had a wonderful time. The food was simple but it was eaten in the glow of Shabbat candles. Now I grant you, having one of my oldest and dearest friends, someone I call “sister” to Shabbat dinner is hardly a wild act of hospitality. Still, it set a tone: we are not going to be hermits in that house, Linda and I. We are going to have guests at the table as often as we can. Food won’t be fancy (not with my cooking!) but it will be eaten with others. I went looking for the source of the midrash that Abraham’s tent was open on four sides, and I found this article by Rabbi Monique Susskind Goldberg. It seems that in the commentary on the mishnah above, Pirkei Avot 1:5, the talmudic commentary gives the example of Job, whose home was open on four sides to all guests. He is then compared unfavorably to Abraham, who actually ran out on the road to welcome his guests in Genesis 18. If Abraham was even more hospitable than Job, then his tent was also open on four sides, or so the reasoning goes. The point is that hospitality is a mitzvah, an key part of being a Jew. So we’ve begun. I’m sure it will be better when we have chairs for everyone and the oven actually works!